Saint Nicholas Church was built in the center of the village of Uima Lokatska, which over time gradually entered the border of the neat Volhynian city and now lives only in the memories of the old-timers. The church was built in honor of the 300th anniversary of the House of Romanov, perhaps the royal family was honored in such way all over the former Empire. The village of Uima Lokatska was described by a writer Marharyta Malynovska, who was born there. The village under the name Bily Khutir was described in her novel Hrymuchi Ozera (Rattling Lakes). For 37 years Oleksandr Voitiuk was the priest of this church. He preserved it in times of atheistic sabbath. And for 29 years now priest Anatolii Sobutsky serves God and people in this church. Sobutsky is local archpriest. He told that during the restoration works fragments of shells and bullets, many of which hit the church during both world wars, are still found in the wooden walls of the temple. And right next to its walls there was a huge funnel, which was left there by a German bomb. The whole was so deep that one could see the foundation there. Currently, Saint Nicholas Church is one of the oldest buildings in town of Lokachi, although it also has its own interesting and ancient history. Even Prince Volodymyr, the one who baptized Rus, visited the place. He drove a large tract of horses from Kyiv to the city named after him – Volodymyr (now Volodymyr-Volynsky). There was also a castle in Lokachi but at the present time there is only the shaft left of it and the name of the territory – Pidzamche (place near castle). At one time, Zinaida Teseniuk, who discovered many unknown facts from the history of the town, taught history in the local school for many years. In one of the Polish chroniclers she found out that in 1787 Polish King Stanislaus Augustus Poniatowski stayed overnight in the home of the local landlord. From numerous legends and narrations we know that on the western outskirts of the town, called Selysko, there was a church but from some unknown reasons it fell into the ground and in that place a deep and hardly accessible lake was formed. In fact, the territory of Lokachi is really carved by numerous underground passages. 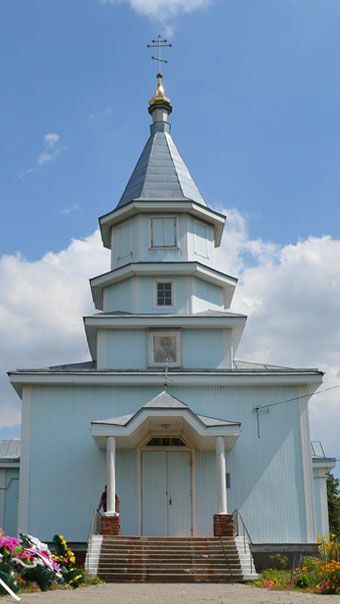 One of the local sights is the so-called “Maiden” Chapel – a small chapel with unique architecture, which was built, according to a legend, on a place where 300 local girls, who chose to die but not to go in Tatar captivity, were executed. Lviv poet Hryhorii Pechenivsky has a poem, that begins with a line “Three hundred captivated girls died in Lokachi…” More than ten years ago the local community planned to open a temple here but for various reasons this never happened. In Saint Nicholas Church, which celebrates its centennial and was build in just two years, is always crowded with people. Reverend Father Anatolii says that people in Lokachi seek God’s Word and spiritual comfort, they care about their church where not one generation of local residents was baptized, had their wedding and burial service.